Unlike other heroes, the event leading Courtney Whitmore to becoming a hero wasn’t tragedy. Instead, it was the breakup of her parent’s marriage and her mother’s remarriage to a man named Pat Dugan. Courtney was miserable in her new life and blamed her stepfather. One day, looking through Pat’s belongings, she stumbled across the gear of ‘The Star-Spangled Kid’ and realized that Pat had once been the adult sidekick of a teenage hero. To make a mockery of Pat, she took his old gear to a school dance. Unfortunately, detecting someone wearing the Kid’s gear, one of Kid’s old enemies thought there was a new Star-Spangled Kid and attacked the dance. Pat came to Courtney’s aid in a suit of mechanized battle armor he had been secretly working on and the two defeated the old foe. Exhilarated by the battle, Courtney decided to continue as a hero. Seeing how well she’d handled herself, and how it could help them grow closer as father and daughter, Pat agreed. However, there was one condition: He would have to fight alongside her as her guardian. Amused that he would now be her sidekick, Courtney agreed and took a shorter heroic name: Stargirl. 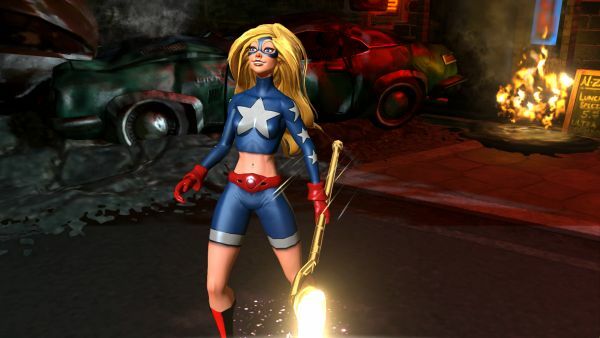 Stargirl will be playable on October 15th. Domino Effect Ltd. has released a new ‘work in progress’ gameplay video for Red Awakening, its team-based multiplayer stealth action game.